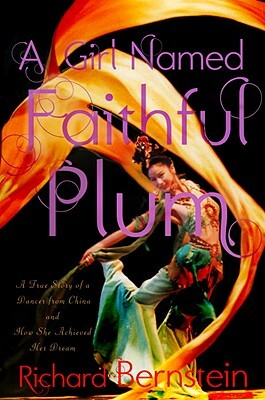 A Girl Named Faithful Plum: The True Story of a Dancer from China and How She Achieved Her Dream by Richard Bernstein. Grades 4 and up. Alfred A. Knopf, 2011. 270 pages. Review copy provided by my local library. It took Li Zhongmei three days and two nights on a filthy, crowded train to travel the 1,000+ miles from her tiny hometown in northern China to Beijing for her audition for the Beijing Dance Academy. She was eleven years old and had never left Baoquanling. Her parents had to borrow money for the train ticket. The Academy would take only 12 girls and 12 boys. From the entire country of China. Her sister told her she never had a chance. Her fellow dancers she met at the auditions told her she never had a chance. But Zhongmei was accepted into the Beijing Dance Academy... and began the most torturous year of her young life. If Zhongmei could survive, she had a shot at her dream. But to survive the physical and emotional strain of that first year would take all of Zhongmei's determination. Zhongmei is a plucky young girl with a stubborn streak and it's easy to sympathize with her struggles. She's looked down upon by both her classmates and her teachers, but their prejudice only serves to strengthen her will. This is an inspiring story, but it's not overdone or didactic. Young readers with empathize and root for Zhongmei, even as they're caught up in the descriptions of the dances she's learning and her day-to-day life in a rigorous school. As I was reading, I especially liked getting a glimpse of China through Zhongmei's eyes. Depictions of her long journey really brought home just how huge China is, and seeing the differences between her country life and life in the city emphasized how diverse the country is. And although I learned about China while reading this book, it all happened organically as I was swept up in Zhongmei's story. The writing left a little to be desired. The story was fascinating enough to propel the book through occasionally stilted turns of phrase and some repetitive passages. The beginning was a little slow for me, with it taking over a third of the book for Zhongmei to get to Beijing and get through her auditions. However, I can appreciate an emphasis on how hard auditions can be, as that's something many young dancers are dealing with. I suppose I wasn't expecting so much of the book to be about the travel and audition process since we know from reading the title that Zhongmei makes it as a dancer. This is an inspiring true story that will be a sure hit for fans of dance and theater books. Although Zhongmei is eleven years old in the book, I think it'll have wide appeal and I'd recommend it to middle grade and teen readers. Once I picked it up, I didn't want to put it down! I'd hand this to fans of performing arts and dance stories like Mao's Last Dancer by Li Cunxin, To Dance by Siena Cherson Siegel, or Bunheads by Sophie Flack. I'd also hand it to kids interested in Chinese life, stories like Chinese Cinderella by Adeline Yen Mah or Revolution is Not a Dinner Party by Ying Chang Compestine. A Girl Named Faithful Plum is on shelves now! Happy Nonfiction Monday! This week's roundup is at Rasco from RIF, so make sure you check it out!